Above is a photo I took yesterday of the Maya murals at Bonampak. 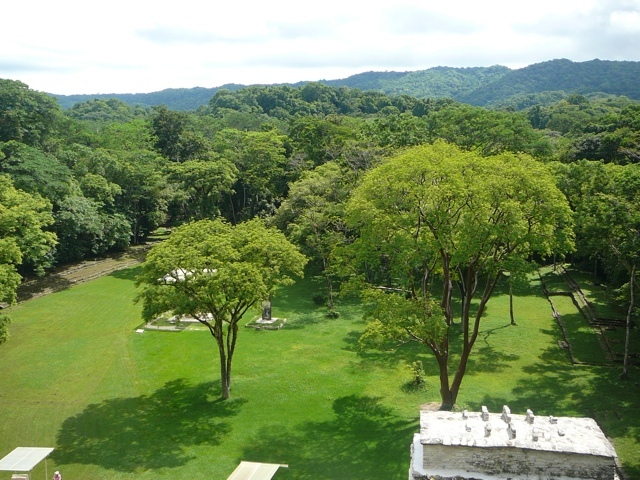 Picture a small vaulted room atop a great stone structure in the state of Chiapas, Mexico, not far from the border with Guatemala. This detail is from a section called The Musicians. It was painted close to the year 800 A.D. These musician figures are rather large, about 40 inches tall. Even after 1200 years it is clear the Maya artists had remarkable skill with figurative art. They are also masters of color. The background blue is a favorite, even today, among the Maya. Mary Ellen Miller, a Yale art historian, has compared these figures to Eadweard Muybridge’s pioneering photographic works documenting the human figure in motion. Each of the maraca players is frozen in motion, a split second after his neighbor. This gives this panel a remarkable sense of motion, a sense of dance. 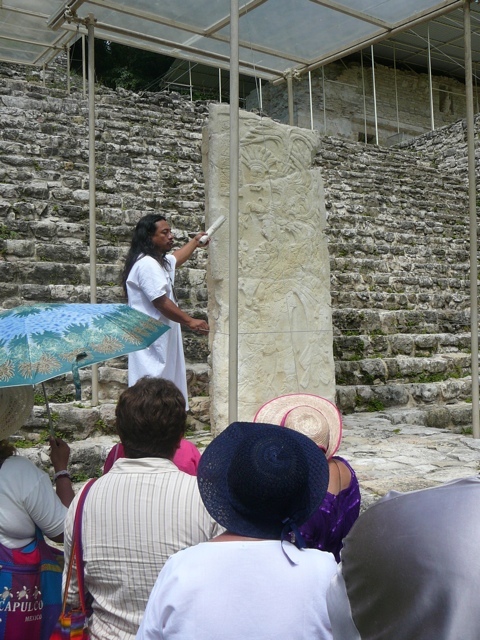 Unlike other ancient cultures the Maya often permit the artists to sign the work. In the case of the murals at Bonampak, I did not see a signature mark. There are two other adjacent vaults at this site that come as a shock after the beauty and musicality of this room. The next vault is filled with scenes of torture, the third with graphic depictions of ritual bloodletting. The Lacandon Maya guards at the vault are very insistent that no flash photos be taken. Visitors, like myself, are allowed in in groups of three. There is little room to turn around. I held my digital camera at arm’s length and shot blind. Considering there is only diffused and blocked sunlight, I am pleased with the results. This is my first blog post via Ipad. Apologies in advance, for brevity and odd formatting. The photo is dark and does not do justice to the wonderful ancient image. I will be able to edit my photos when I return and will add more then. The murals are in a denses jungle region, the site is now a national park. The Lacandons made a deal with INAH, the Mexican office that oversees archaeological sites. They gave up any claim to the plazas, altars, and temples of the ancient Maya, but insisted on control of the last five kilometers of road to the site. My group disembarked from our bus and piled into 10-passenger vans with taciturn Lacandon drivers. This system creates jobs for the Lacandon and also makes looting unlikely. 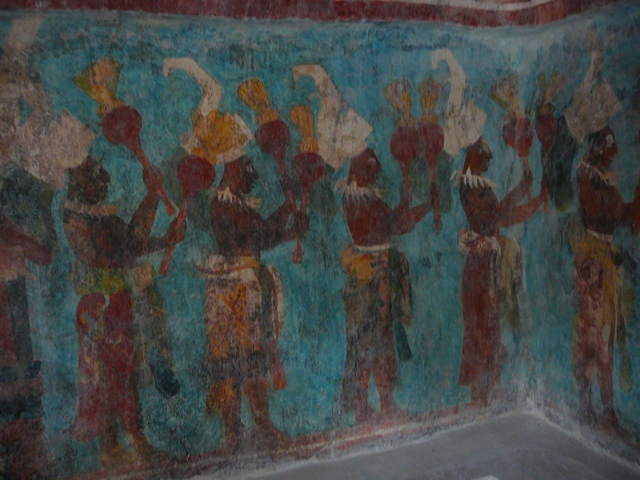 At one time the Lacandon were even more protective of the murals at Bonampak. One of the first North American visitors to the site was shot dead for looking at these same murals without tribal permission. This event was not exactly ancient history; it took place in 1946.